(Adam) I’ve done this race twice, and missed out this year as I couldn’t fit it in the schedule, but you might like to hear from Doug Richardson who placed 17th male this year! 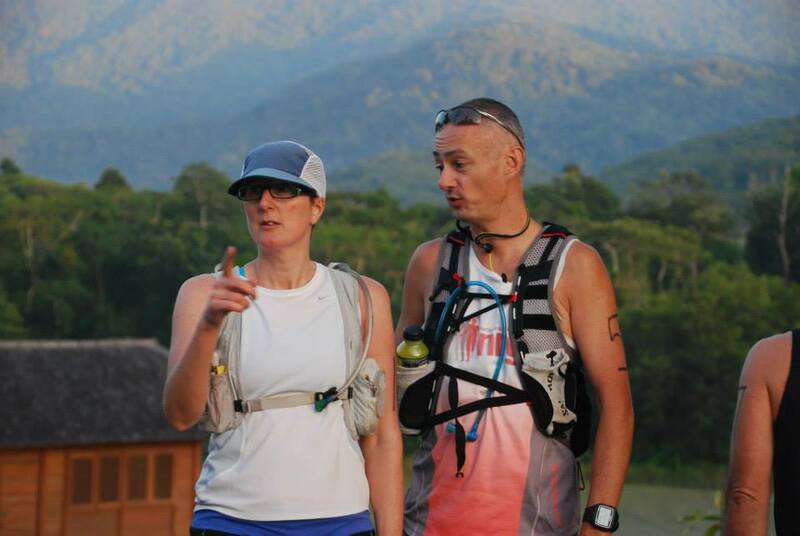 It’s a great race, stick it on your planner for next year……..
(Doug) It’s hard to believe that this time last year the FFFTM was my first trail race. Two marathons (Hobart and 6ft track) since and a failed TNF50 attempt, here I was to face my demons of cramping with the inner quad muscles on race day for these long events (as some of you may know have haunted me in recent times). The race last year at least gave me positive thoughts as I managed to complete that without the dreaded muscles spasms, maybe it was the cold weather or just being ‘super’ hydrated that time drinking plenty of electrolytes and water during the near two hour drive down to the Southern Highlands. So I decided to repeat that strategy and keep the fluid intake up again this year and added artillery such as 3 ‘Shotz’ tablets (sodium and magnesium electrolytes that mix with water), many salt tablets and the standard gels (Second Surges) to take throughout the race. The Rural Fire Service are the beneficiaries of this event and they again put a great effort in with their presence and water stations throughout the race, so I elected to take my palm held water bottle as the sole race hydration carriage thus avoiding the extra weight and restriction of a water pack. Weather on arrival was clear and certainly crisp but that would not last long as temps of around 25 were expected. Runners were relieved it was not held the next day (Sunday) or a couple of days earlier when temps were in the high 30’s. A quick hello and good luck to Chris Johnson from NRG and I made my way to the starting line, allowing the elite runners like Brendan Davies, Ian Gallagher and Beth Cardelli plenty of space for a clear take off in the rather narrow starting shoot. At the line I remembered I had forgotten something in the car …another potential remedy for cramps, “pickle juice”. Yes I actually drank this stuff at the Coastal Classic last month at the onset of cramps at 24km and it provided relief although for a short time, as they returned later in that event. The starting horn went off at 8am so it was too late to worry about that delightful tasting remedy now. The first couple of kilometres are a little ‘narly’, although on fire trail, you need to watch your footing. Up until the first 8kms, the gradient is up and down but nothing to difficult and actually includes some coverage on a gravel and then sealed road for about 2km where you will find your fastest km pace for the race. 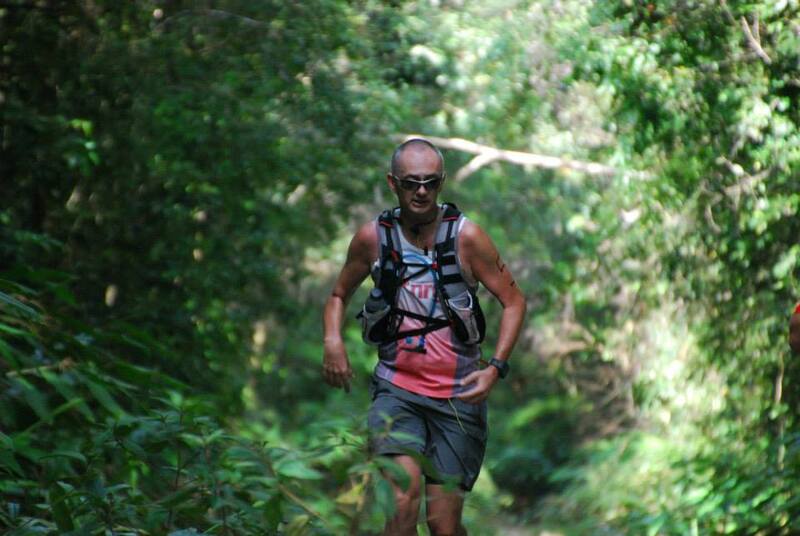 Km’s 5-7 were in the 4:19 and 4:34 pace and I felt very comfortable including the climb up to the 8km mark where the real fire trail began and the downhill section to come. This next section got technical with some sharp descents and the choice is there to either go leaping down many rocks (John Lewis style) or take the more cautioned option with smaller careful paces, the latter I chose, as I still lack the technical sharp skills of downhill rock running. At the 10km mark, the downhill ceases for a short while, where you cross a small creek with some minor rock jumping and head back up in elevation before another drop down. It was at this time I needed a ‘nature’ stop so I knew I was at least well hydrated ! The first water station was about a further km on so I stopped again and that was where I took my second electrolyte tab (first was in the water bottle at the start). Next 6km were uphill but with the recent hill training that I have been doing, this climb was actually reasonable and I was able to maintain a good steady pace, overtaking many on the hills that had overtaken me with my recent two stops. At the 20km mark, the first out and back sections begin. About 2.2km downhill to a turn around point and then back up hill to the water station that aids the marks of 20km and 24.5km. It was at the 20km point I saw Brendan Davies coming out of the uphill climb in first position looking in control and very comfortable and gave him some encouragement (not that he needed it) as he powered on with Ian Gallagher in close pursuit, so you can gauge how far the leaders are ahead of you – 4.5km already in my case ! Beth Cardelli was clearly leading the women’s race. I saw Chris Johnson at the 24km mark and gave him a high five and he seemed to be travelling well as he headed down for the out and back section. After that first out and back you make a right turn into another fire trail for about 3.5km and reach a small hill at the 28km mark where another aid station existed this time with electrolyte drink, fruit, lollies and coke. Not sure actually why I stopped here at this aid point looking back at my race review (maybe it was the lollies – no jubes Rocco), but you then start a smaller out and back of 1km downhill (60m drop) to a turn around point and then the 1km back uphill to the same aid station. Some magic views of Kangaroo Valley and the cliff faces can be seen during this section on a bright sunny day like it was as opposed to the mist from last year. The return aid station was where I was to have my last electrolyte, another salt tablet, gel and some fruit and get set for the next section which I knew for memory was the ‘wall’ with 9km of gradual fire trail climbing in sunny semi-open conditions where the temperatures began to rise. This section is not particularly scenic and I was beginning to think that I should be cramping about now. So to help combat any chance of that happening, I began using the leg muscles by running in different stride lengths, lifting the knees up and higher kicks and even opening the stance of the feet so that you look like you are semi-waddling like a duck ! Anything really to avoid the repeat usage of the same muscles through the race and to just provide a different approach. Definitely the toughest section of the course, but I was beginning to pass a few more people. I don’t think I was getting any faster (in fact I wasn’t as my splits were in the low 5min/km range), it was more the runners ahead were hitting the wall. Respiratory I felt great, although it was getting warmer, the heat was bearable and I poured water on my head from the hand held bottle where I could ration (although the number of water stations ahead allowed me to do this). So feeling good, but my mind was clearly focusing on avoiding cramps so I needed to think of something to distract me and I just started to say to myself it’s just a training run – treat it like an NRG Six Foot Track long away run – no race pressure, just go with it. 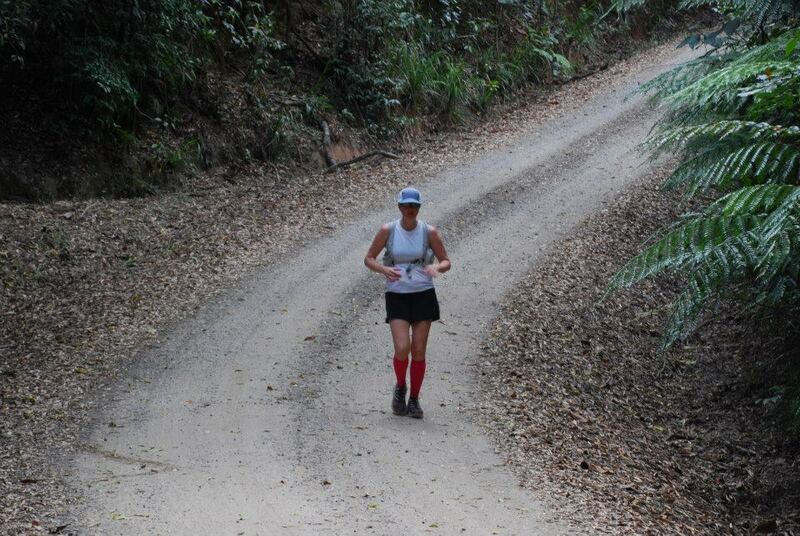 Two more water stations passed and I reached a quick downhill section before another smaller 40m climb at the 39km mark. Feeling okay still, I really wanted to give this hill climb a go so I tried some more powerful strides and then I could just slightly feel the beginning of the dreaded cramps again in the inner quads. But I played it carefully and decided to walk this hill, stretching the legs considerable whilst I walked up talking to myself that just reach the top and then take off again. This seemed to help as I felt the initial tightness go away as I was ‘stretch walking’ up that hill. So I got to the top knowing that some of the runners behind may have caught up a little ground but I now felt comfortable to go a bit harder. 2,400m to go (6 laps of a running track I thought to myself) and I will succeed beating my demons. Another sharp downhill section and then one final rise up to the finish to go, so I used quicker smaller steps to make sure I killed off any last minute concerns up that last climb. I crossed the line in 3:39:15 net time and was relieved and elated at the same time if that is possible, (a) because the demons were beaten FINALLY and (b) I had some time goals with splits written on my arm with an ambitious sub 3:40 finish in this event (in fact it the desired goal was 3:39). I then had a quick chat with Brendan and Ian and congratulated them on 1st and 2nd respectively. Those guys are superb runners. Brendan asked how I went and I was just chuffed to say I took 11mins off last year’s time. A look at the final results sheet whilst devouring the free and amazing ‘hamburger with the lot’ put on by the RFS and I was amazed that I snuck into the Top 20 positions. The drive home was a pleasant one as a result and aided by some post race Endurox R4 chocolate recovery powder with milk (cash for comments there Matt Cherri – ching$ching$), the legs felt good. Thanks again to the local RFS with their help supporting this race. It really is a nice event and I will be back again hopefully next year for #3. Chris Johnson finished with 5:05 but I didn’t get a chance to speak with him afterwards, well done Chris ! Said g’day to Michael McGrath who completed yet another marathon here and snuck into the Top 40. Other names I noted were Jason Wheeler (aka Gater Bullant) in a superb 3:22, Justine Medin 4:24 and Jess Siegle in 4:31. Apologies If I have missed any other names. Brendan won the men’s event in 2:58 and Beth in 3:24. Course profile (elevation chart) included. * Please note that as far as I know, all the photos in this blog post were taken by Kimberly White. She did a great job didn’t she! I’d had this run on my mind for some time. Not sure why, must have been the name. Basically it’s an out and back along a fire trail up Mt Molloy from Jullatten pub, about 90km from Cairns, and just up the road from the attractively named Abbatoir Swamp Environmental Park. I’m guessing that the driving made the field a bit small- 9 males and 4 females rocked up for the 3rd running of this event. I’m amazed and extremely grateful that the organisers put so much effort into running such a small event- did I mention that I love small events? 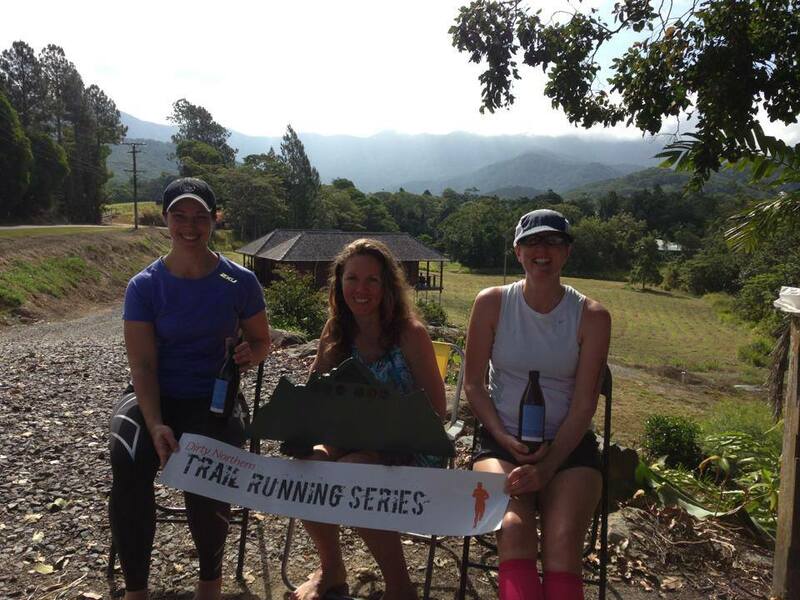 There were km markers every km on the way up and down, friendly faces at the aid stations, and did I mention the food? 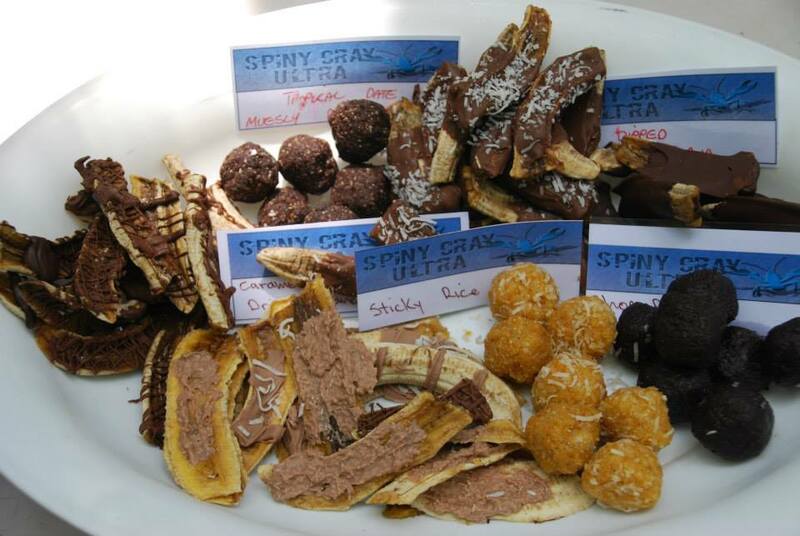 Gourmet delights everywhere, I’m just sad I didn’t have more eating time at this race. How awesome is this checkpoint food? After the race briefing in the first photons of sunlight, we assembled at the start line just outside the Jullatten Highlander Tavern (great spot) and the RD quietly counted down the last 10 seconds, and we were off. We settled into a nice easy pace about 5:44/km and I had a good look at the people in front. The entire race of only 13 entrants made it easy to count the people in front- 6 guys and one female. This meant for a top 5 (male) finish I only had to outlast one of the guys in front. That’s good, because my only talent is outlasting people. The first 10km is fairly harsh uphill, it’s possible to run some of it, but the primary goal is not to blow up too much, there’s still a long way to go. I managed to catch up to the leading woman Sarah Warren and we had a short chat. She wasn’t feeling very confident, but I could tell she was a classy runner, very consistent and pacing herself nicely. 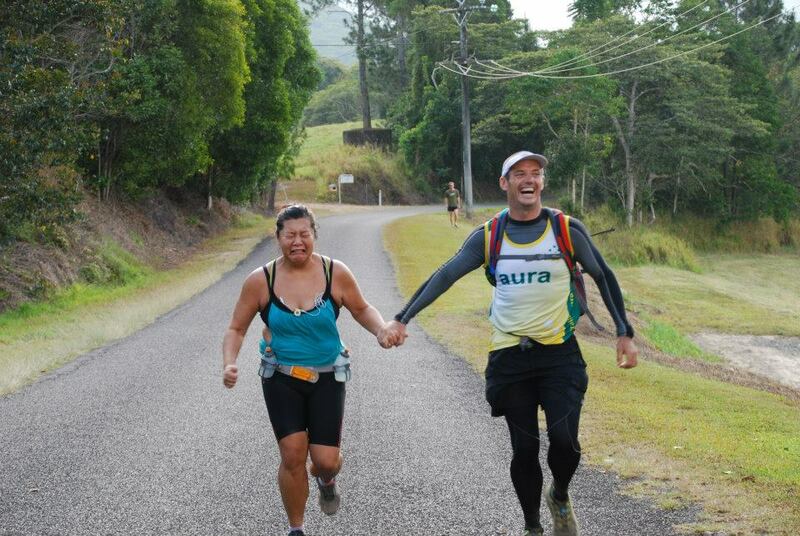 I let her go, and a couple of km later noticed that I was being hunted down by another runner behind. I’d noticed a group of 3 blokes in front and one of them was starting to weaken. I felt I had a good chance at making that one extra place I needed so I stopped a bit and waited for the guy behind to catch up. No point in suffering alone! This turned out to be a good move, as my new friend Paul Firth was an Army guy and very interesting to talk to. At about 16km Shawn caught up with us- he was part of a group in front, but had left the tail for a comfort stop and we’d passed him. 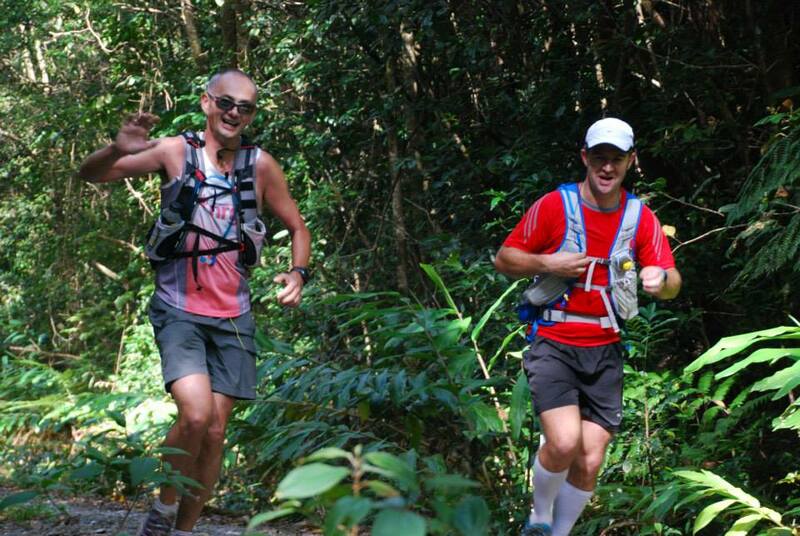 He then turned around at the 18km mark for a 36km total. This meant that Paul and I had 5th place and would have to fight it out. 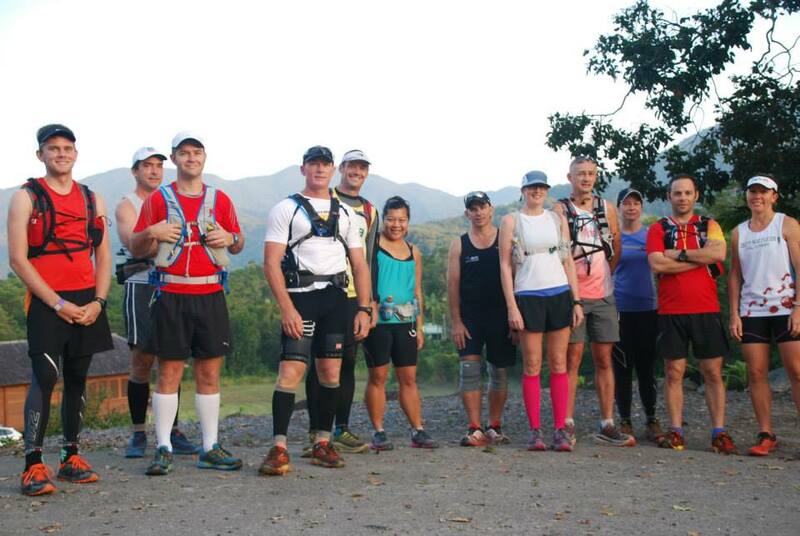 We encouraged each other to keep moving and generally had a great time up to the 29km turn around point. My father in law (Andrew Campbell) was manning this aid station, so I had a quick chat but tried not to get too comfortable! I restocked my gel, had some Pepsi and dropped a few things I wouldn’t need. I’d previously given Paul the pep talk ‘don’t let me get in front of you on the way down as I won’t give up that 5th place easily’. 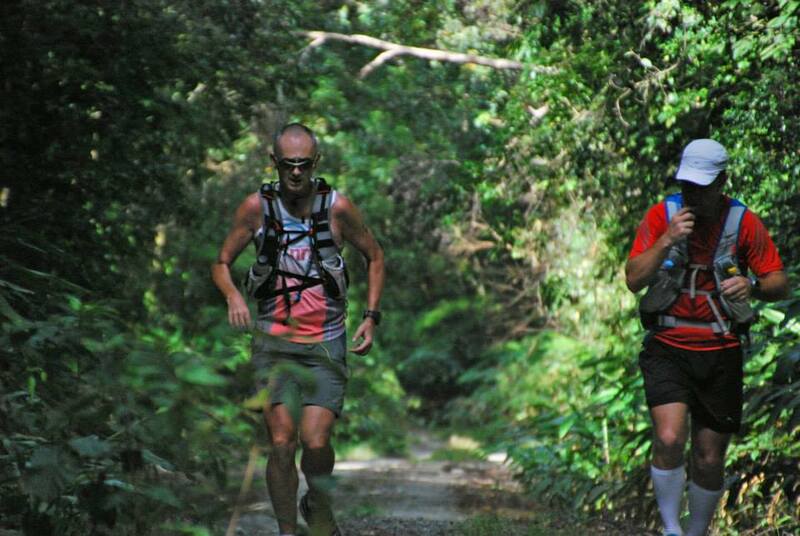 Me and my big mouth- he put his headphones on and blasted down the hill, making up nearly 20 minutes in the last 29km. Great performance, and he totally deserved that 5th place! My legs had been hurting from the training load from very early on, and it was difficult to take advantage of the lovely downhills. There was a creek crossing at the 22/36km mark and I stopped there to fill up my water- what a huge pleasure it is to be able to drink the water! 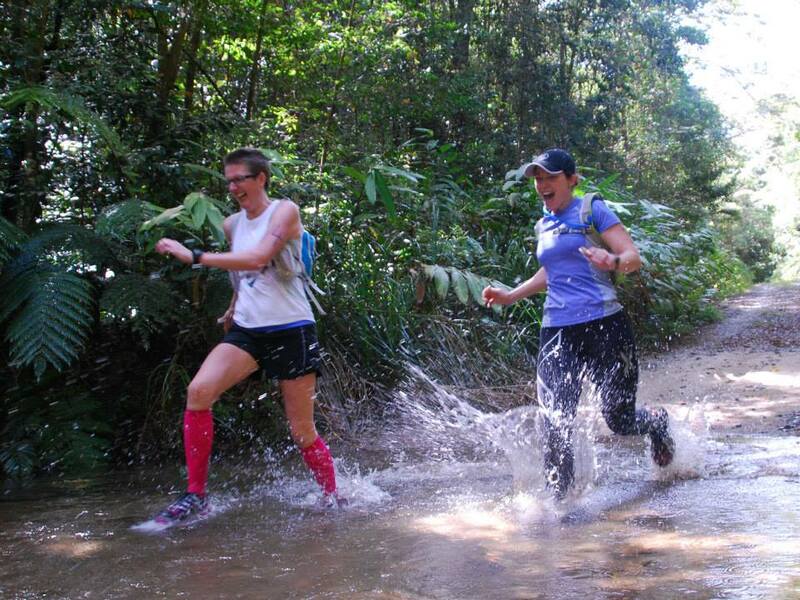 I can only hope that one day we get cleaner water in Sydney for our runs. On the way down the sun became an issue- we’d gone up in mostly shade with only a few patches of sun, but now it was hot and unrelenting. My headphones that had been around my neck were only playing on one channel as one bud was so full of sweat. Yum. I spent the last few hours counting down the k’s and trying to concentrate on keeping good form and turning the legs over as fast as possible without blowing up my heart rate. It became clear that a 6:30 finish was not going to happen (the loose calculation was 3:30 up the hill, 3:00 down the hill) so I relaxed and tried to make progress. With 3km to go I started to fall apart, my body not wanting to listen to my brains ‘come on, surely you can run 3000m’ but I held on and finished in 6:47. Pretty much exactly in between my predictions of 6:30-7:00. Placed 7th overall, 6th male and 2nd in my ‘masters’ category. Dear race directors- I’m not sure being over 40 should put you in the masters category, you cheeky (young) bastards. Our race entry fee included a beer which I gratefully accepted, then I ordered a chicken burger (I love races that finish at a pub) and sat around waiting for Sarah. It was getting hotter, and after her experience at last years Glenbrook Half, I was quite worried about her reaction to the conditions. When we spotted her I went out to run the last 50m with her- that was long enough for her to tell me ‘I never want to do this again’ over and over. I hope her result makes her have second thoughts- her time of 8:47 got her 3rd female and 1st in the masters category. full results here but you’ll have to scroll down. I want to congratulate all of the hard working organisers and volunteers, this was a small race (for us- there were 2 other distances run and finished while we were on the run) and impeccably managed. The food, the run and the people were all fantastic. Also thanks to MountainSports for providing a couple of entries to the Glow Worm tunnel Marathon– I didn’t score one but you may see me there anyway.